Get ready to rack your brains, because it's time for another Scrabble Challenge! I may have gone a little overboard on last week's challenge (there was over 25 anagrams to solve), so I'm slimming things down this week. This time, there's only one puzzle. Use the rack of letters above to find the highest scoring move on the following board. Post your answer in the comments at the bottom of this page. But let's try and keep this fair—NO solver programs. Also, don't forget to check out the solutions to last week's puzzles below. ** Click here for the answer to the above puzzle. 1. Alfred Butts middle name is Mosher. 2. The city where Alfred Butts passed away is Rhinebeck. 4. Hasbro currently holds the Scrabble trademark in North America. 5. Mattel owns Scrabble outside of the U.S.
Scrabble Challenge #19: Would You Rather Play a Phoney or a Phoney-Looking Word? How about GLAM across, connecting to ON to also spell MON. 24 points. Close, but there's something even better. The answers have been posted, so check them out! Or keep trying! Not everybody knows every word! GLAM is one of these easiest words to spot out of the bunch, alongside ALUM and GLUM. It's really easy to miss GLOAM, especially if you don't know what it means and have never heard of it before. GLAM is definitely a good play, but GLOAM would be the "highest scoring" option, as well as the best play. This move does not open up the TWS directly, because there is no hook (letter) that can be placed in front of GLOAM to spell another word while spelling another down to the TWS. So, it would at least take another turn for the TWS to open up—hopefully for you. Also, you eliminate two TLS squares—the more you use, the less you're opponent can use. The other high scoring option was GLAUM (which is only acceptable in play outside of North America using Collins Scrabble Words). Everything mentioned above applies to this word the same as GLOAM. The second best play is ALGUM, and also doesn't open up the TWS. But I would stay away from this, because if your opponent has an A and X, they'll be able to utilize the DWS and play AX parallel on GU, also spelling AG and XU for a total of 39 points. The same goes for playing GLAUM. So, it would seem that GLOAM is indeed the best option, because it does not allow an X to be played on the DWS. You could continue to over think the repercussions of your move, but in tournaments and clubs, there is a time limit, so you don't have that luxury. At that point, after years and years of practice, it becomes instinctual. If this was the end of the game and there were only a few letters left in the bag—then it would be a good idea to think of all of your opponent's options, especially if it's a close game. I hope this all makes sense. I'm sure other people would think other moves would be better, but overall… this puzzle was just about the highest scoring word and that's it, which would be GLOAM (and maybe GLAUM). 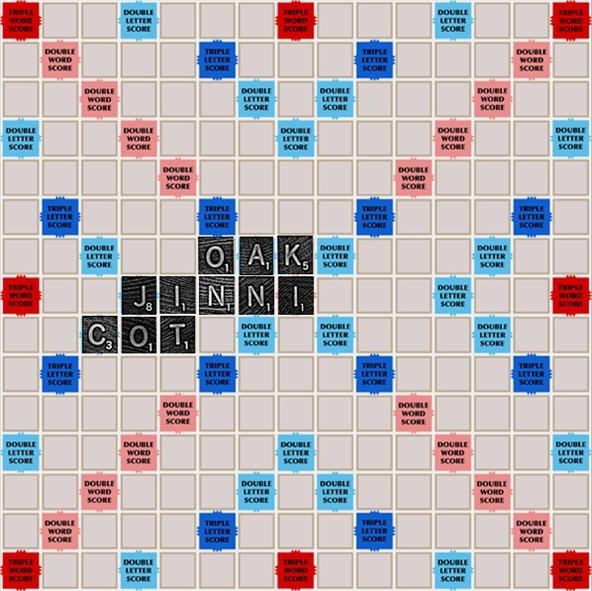 I have never tried Jinni?what do you mean by it?I can use it if it is an acceptable word..
JINNI is definitely an acceptable word. It's just another spelling variation of GENIE, a supernatural being in Muslim mythology. There's many different spelling variations. I covered this more in this old challenge and this old word of the day (SHAITAN), which is related.